When the discussion in the SNB Forums turns to alternatives for outdoor wireless links, EnGenius' products usually are mentioned. Whether it's a relatively short hop between a home and detached worshop, or linking multiple buildings farther apart, EnGenius seems to get the nod. But after many years of pointing to other people's recommendations, we figured it was high time we found out for ourselves whether we really should be recommending EnGenius outdoor bridges. In this review, I'm going to take a look at EnGenius' relatively-new entry-level 2.4 GHz N150 outdoor bridge, the ENS200. The ENS200 is designed to allow consumers to easily connect building networks without running cables or to connect to a wireless ISP or hotspot over long distances. 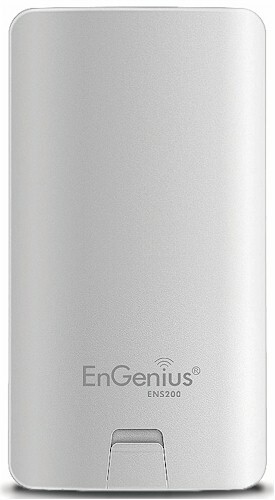 The ENS200 is the entry-level model in EnGenius' line of AP/bridge and antenna combos housed in waterproof plastic casings. It is closely related to three other 2.4 GHz N150 bridge products, summarized in Table 1. The ENS200 is housed in a gray plastic IP65 waterproof enclosure measuring 3.9”W x 7.3”H x 1.1”D. The case has both screw slots for wall mounting and a curved feature for pole mounting. The figure below shows the ENS200's LEDs and dual 10/100 Ethernet connectors. The LED location is rather odd, since none of them would be visible when the device is mounted. So they would be of little use for setup or diagnostic purposes. The ENS200 is powered by a proprietary power-over-Ethernet (PoE) connection, using an included PoE injector and power wall-wart. I wonder why EnGenius opted for a proprietary PoE connection? Although EnGenius gets points for providing the PoE injector, the device would be more flexible if it used standard 802.3af or at. That way, it could be powered with an off-the-shelf PoE injector or standard PoE-enabled switch. In addition to the PoE injector and power supply, EnGenius includes two tie wraps for mounting the device to a pole, as well as a couple of screws for mounting to a flat surface. Inside the case is a single main board. The antenna is the flat metal panel, shown to the left of the main board in the photo below. Located on the main board of the ENS200 is an Atheros AR9285 2.4 GHz N150 single-chip radio, an Atheros AR7240 wireless network processor with a 400 MHz CPU, 32 MB of RAM, and 8 MB of flash. The ENS200 has two 10/100 Ethernet ports. One of the ports, labeled PoE, must be connected to the Ethernet cable coming from the provided PoE injector to power the device. That same port can be used for the LAN connection, or you can run a separate cable to the other 10/100 port. I've put a few other pictures of the ENS200's insides in the gallery below. I put together this feature summary based on EnGenius' ENS200 specifications. Note the operating temperature range with a low of -4°F. As I write this, the overnight low for Madison, WI is -7°F. I wonder how the ENS200 will perform in the northern climates during periods of cold weather?